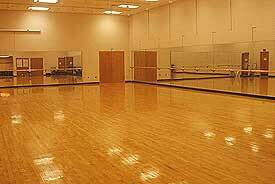 Located next to the front desk of the Gillett Wellness Center is our large and spacious dance studio. The studio features a professional quality dance floor, full-length wall-to-wall mirrors and an observation and lounge area. The studio is equipped with various aerobic equipment including exercise balls, aerobic step benches and stationary bikes. The dance studio hosts our group fitness and Physical Education classes, which are offered throughout the day. Group fitness classes are available to students, faculty, alumni and the public.